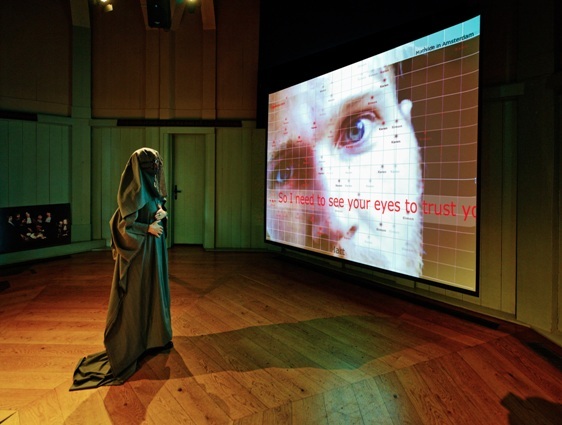 Here Tele_Trust invites you to wear a full body interactive DataVeil, inspired by a monks’ habit, a burqa, Darth Vader, a business suit. Everyone can wear a DataVeil. With flexible touch sensors woven into the smart fabric of the veil, your body in the Dataveil becomes a wireless interface, allowing to connect with other people's smartphones. Audience members meet in an intimate body experience, to exchange stories about: Am I here with you? Who is watching who? Who is controlling who? In what identity and in whose body?